On 19 February 1960, US filmgoers got their first chance to see Ile de France wrecked and partially sunk before their very eyes as “The Last Voyage” debuted in theaters nationwide. Many great liners met very sad ends: Queen Elizabeth (1940), America (1940), Raffaello, Independence and Caronia (1949) among them. Yet the proud Ile de France suffered the cruelest farewell of all—used as a disposable prop for a B movie. She certainly deserved a better send off than the public torture and execution Hollywood inflicted upon her. 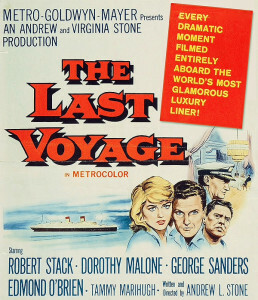 As The Last Voyage’s star, Robert Stack, noted in his autobiography, “Straight Shooting”: “No special effects for [director]Andy [Stone]; he actually planned to destroy a liner and photograph the process.” And so he did, to the dismay of what was then a relatively small and unfocused ocean liner fan community. Imagine the uproar that would happen today if a film company announced plans to gut and sink United States or Queen Elizabeth 2 for a movie.